Baie Des Iles has been all the rage with punters as momentum builds around Katie Walsh's mount in the Randox Health Grand National. Walsh will be teaming up with her husband, trainer Ross O'Sullivan, and is confident seven-year-old mare Baie Des Iles can give a bold account in the Aintree spectacular on Saturday, granted the requisite luck in running. Walsh - who finished third aboard Seabass in 2012 - is bidding to become the first woman to ride the winner of the world-famous race, with Bryony Frost and Rachael Blackmore also targeting the same accolade aboard Milansbar and Alpha Des Obeaux respectively. She said: "There is so much luck involved in a Grand National. It can depend on where you've been positioned throughout the race or whether you're behind a horse who doesn't jump well. There are a lot of variables involved. "Every runner has a chance of winning the Grand National - you just do not know what is going to happen. We're really excited about Baie Des Iles and it will be great to be a part of the race again - I'm really looking forward to it." Walsh's mount was a creditable third in the Grand National Trial at Punchestown back in February on heavy ground and conditions on Merseyside are not expected to pose a problem. She added: "She has plenty of form on heavy ground, but she has a good action and I think better ground wouldn't be too much of an issue, either. We're counting down the days now, but it's going to be a great experience. "I'm looking forward to riding in the race again and especially for Ross." Rising star Frost teamed up with Milansbar to good effect back in January to win the Classic Chase at Warwick and octogenarian owner Robert Bothway is hoping the pair can triumph again. He told Racing UK: "We were hoping to run in the National last year, but we didn't get in and this year when we were down the list, we didn't dream of getting in. "He's always jumped well. He's by Milan, he stays forever, the wetter the better and he never hesitates at a fence. "When he won at Warwick, Bryony had never sat on him before and she just gelled with him straight away. He won 11 lengths and would have gone round again and I was so glad Paul Nicholls let her ride him this year. "I'd been following her with the winners she'd had and she gelled with the horse. "She said her father (1989 Grand National-winning jockey Jimmy Frost) had given her plenty of advice and said if everything goes all right he'll be in the first five. "I'm not a very good watcher, but I will watch it. It would mean very everything (to win it). I'm over 80 now and it would be a dream come true." Paddy Power offer 20-1 from 33s about Baie Des Iles, with spokesman Paul Binfield saying: "The Katie Walsh factor is definitely coming into play with punters taking the view Baie Des Iles has the right profile for the race and remembering how Katie only got collared at the elbow a few years ago when a magnificent third on Seabass." 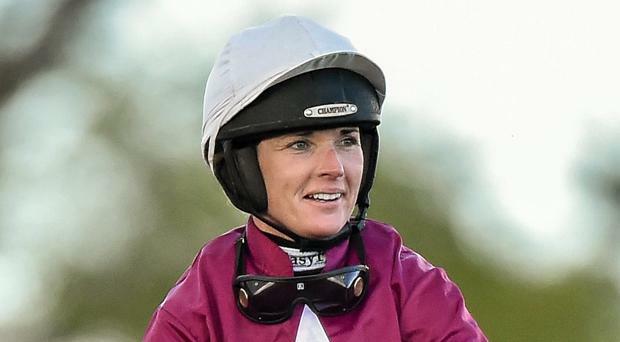 Betway's Alan Alger said: "Katie Walsh tends to attract some attention in the betting when she has a ride in the National and this year looks no different. Her mount has been very popular in the last 24 hours and looks like being this year's big gamble. "The mare has been backed into 20-1 having been a 33/1 shot on Monday with punters seemingly choosing to ignore the fact a mare hasn't won the famous race since Nickel Coin in 1951. "Walsh has some good experience over the National fences and is our favourite to perform best of the female jockeys at 11-10, ahead of Bryony Frost at 2-1 and Rachael Blackmore at 11-4." Blaklion has been at the head of the ante-post market for some time, despite defeat in gruelling ground at Haydock in February. The Nigel Twiston-Davies-trained nine-year-old looked the winner for a long way last year, but ultimately had to settle for fourth. Assistant trainer Carl Llewellyn said: "There's a big difference between recent heavy rain which makes the ground wet but easier to get through than gluey ground. He can get through wet ground as long as it is not deep and holding. "I've got no worries about his stamina not lasting out this year. "I think he jumped and pulled his way to the front too early in last year's Grand National and we will learn from that. "He used too much energy from the fourth-last to the final fence. If Sam (Twiston-Davies) holds on to him for a lot longer in this year's race, then we would be hopeful of a big run." The going on all three courses at Aintree was officially changed to soft on Tuesday after, eight millimetres of rain in the last 24 hours. Clerk of the course Andrew Tulloch said: "On the Grand National course, the going is approaching heavy at the Canal Turn. "The rain today cleared by 11am and, looking at the forecast going forward, most of the rain should now be behind us. Further precipitation is set to come in the form of showers for the rest of the week." Harry Clarke Twelve-time champion jockey Ruby Walsh has insisted he has no plans of retiring any time soon.